Powerful, intuitive sampler Serato DJ plug-in that's compatible with leading DAW programs. Serato Sample is a powerful and intuitive sampler plug-in for producers that allows you to quickly find, chop, key shift and time-stretch samples. It also has the world-famous Serato Pitch ‘n Time algorithm built in, giving you the best key-shifting and time-stretching quality in the market. With Serato Sample, you’ll enjoy flawless key detection and key shifting—find the key and then shift it with the power of Pitch ‘n Time. In just one click, Serato Sample’s algorithm finds 16 of the best samples to work with. Alternatively, you can let the Random feature dig for some gold nuggets. Change your samples beyond recognition with individual manipulation of pads; mess around with key, bpm and more with pad parameters. 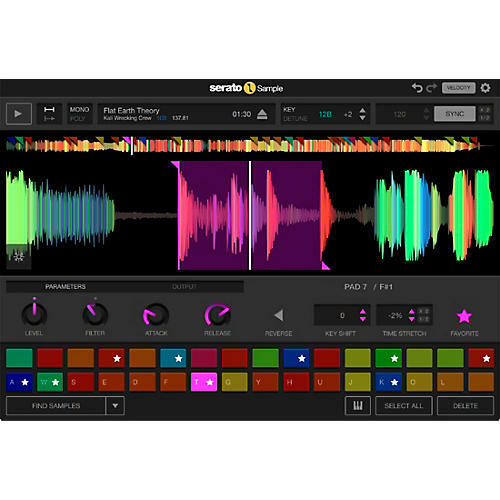 Serato Sample works in leading DAWs, including Ableton Live, Logic Pro, FL Studio and Maschine, but will also work in other DAWs that support AU/VST plug-ins. Expand the creative boundaries of your music production—order today.